Why does my TypePad control panel show my disk usage as 0.0% ? 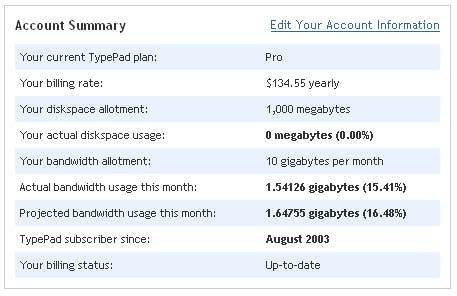 If TypePad aren't even bothering to record my disk usage properly then why even show it on my control panel? I know that my files haven't disappeared, so why frighten me with this unnecessary misinformation. 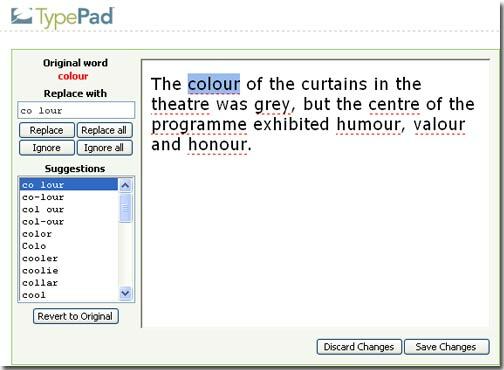 Typepad have just added rich text editing and integrated spell checking to their blog offering. Now this is very welcome, but why couldn't they finish it properly before they launched it. I live in the United Kindgom and we are not officially part of the United States whatever Tony Bliar may say. I have dutifully filled in my Author Profile with the correct settings. 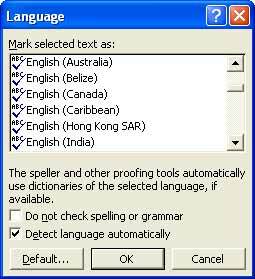 But of course these settings are ignored when it comes to spell checking where I am treated as a US English speaker. Here is the text after I have 'corrected' it. 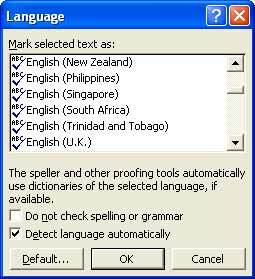 Now, if I type the same text into Microsoft Word I get the correct spell check. 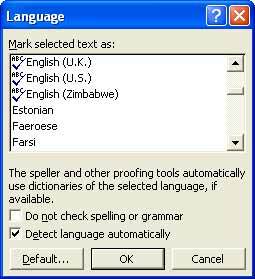 This is because Microsoft provide me with a selection of eighteen different versions of English to spell check against. 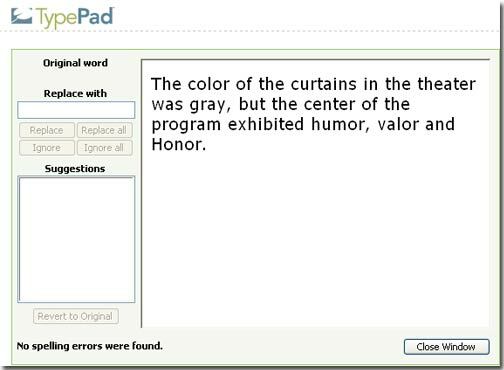 I understand that Typepad want to release new features as soon as they are usable to some of their customers, but if they think that an American spell checker is useful to me then they are much mistaken. 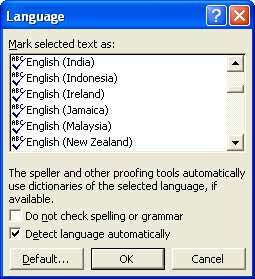 I would much rather not have spell checking until they can get hold of a UK English dictionary. Typepad want to be a global provider of blogging services, but they really must stop treating the english speaking world as 2nd class Americans if they want to be successful. and I got this error, which threw me as I had definitetely entered an hour between 1 and 12. The error was caused because I had typed "08" instead of "8". When I looked at the details on the post page I saw that Typepad displayed the hour as "08" but didn't allow me to use that format for my data entry. 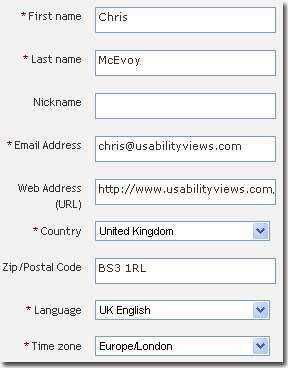 They also display the date in US format even though I set my country as United Kingdom in my Typepad user profile. After playing around with the post ahead feature some more, I discovered that if you set a post ahead date and then changed the option to "Publivh Now" it would use the future date for the posting, which meant that I could post an entry that was dated August 2007. It also created the archives for August 2007 which was really confusing. I wish Typepad would test their software a bit more as there is no good reason why I shouldn't be allowed to enter "08" instead of "8", especially when they display their hours in the same format. It would be nice if they could make the effort to display the dates in UK format as they know that I am a UK customer. There is no excuse for allowing posts to be published with dates in the future as the Typepad system should deal with the fact that I may change my mind about setting a future publishing date. These point may appear to be petty, but if US companies want to be successful in the rest of the world then they need to put more effort into their internationalisation efforts. Well, I must say that I am impressed so far, it only took me about 2 minutes to set up a blog and make my first post on the new blogger. I think that the people at Adaptive Path have done a fantastic job, especially with the re-design of the registration process. It is so simple that they must have put a lot effort into the design. Mena says it's "based on a lily pad", but I just don't buy it. It must be a Pacman Kite just as the wind has dropped. Well done TypePad. You have managed to turn a harware problem into a trust building process. Amazon TypeList : Is Six Apart Anti-Canadian? Did someone at Six Apart drink a dodgy bottle of Bordeaux? Or maybe they are upset about the Mickey abuse at Eurodisney? Where are amazon.ca and amazon.fr ? So, can I can blame Amazon for the fact that TypePad can't deal with French or Canadian Associates? If Six Apart are to make TypePad a success with people who have never blogged before, then they must get their existing Typelists right before they start introducing new ones. You can see an example Reading Typelist called Understanding Programmers in the right-hand column. The ability to type in an ISBN and have an item added to the list is an excellent idea, but it needs to be implemented properly instead of doing half a job. This Reading TypeList feels like something that has been designed from a very specific point of view instead of looking at the requirements of the wider group of users. The fact that the section shown in the screenshot above is titled "Miscellaneous Information" shows that this functionality may have been cobbled together instead of thoughtfully designed. I live in the UK and have associate account with all the english speaking amazon sites (.com, .co.uk and .ca). I would have associate accounts with the other sites, but I can't fill in the application forms as my foreign language skills are terrible. On my own book lists I provide links to all of the amazon sites as I don't want to be .com centric. I do hope that Six Apart have not included amazon sites based on the availability of their own asociate IDs. I think that the Amazon TypeList should allow you to enter an associate ID for each of the national amazon sites. Instead of just allowing me to select one "Local vendor" I should be able to choose which national sites I want to appear on my list. If I chose .com, .co.uk and .ca TypePad should display three little flags that would link to the appropriate amazon site. Failing this, it should detect the locale of the user and present them with the amazon link which is most suitable for them. I don't like the way the standard associate link takes you to the "You may also be interested...." page instead of the product details page. I find that my eye is drawn away from the book detailsto the table of related items underneath. 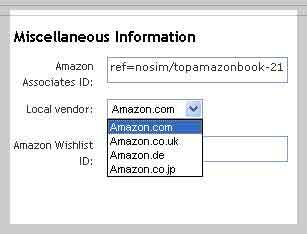 If you want to link to the product page rather than the related to page then enter ref=nosim/[associate id] rather than [associate id] into your Amazon Associates ID box. (You should be aware that this method has it pros and cons.) If you change your Associates ID in TypePad then all of the amazon links on your Amazon TypeList will be updated, but if you change the Local vendor (.com .de .co.uk etc.) the change will only affect books that you subsequently add to your lists, it will not update existing entries in your list. It does not take much effort to use the Amazon Web Services to get thumbnail pictures for books. If the .co.uk Amazon sitre does not have an image, then try and get it from the .com site. If you try this and you still can't get a thumbnail from Amazon (or you only get a zero pixel size image) then please, please, use the No Image Available image. I sincerely want TypePad to succeed. Heck I'm almost a paying customer. I believe that the sort of functionality provided by TypeLists will make or break TypePad and if Six Apart don't put 110% into making them absolutely fantastic then TypePad will just be a cheap host with some fancy blogging software. "Good Enough" is no good. This feature must build on the Amazon Web Services instead of just exhibiting the same limitations. I want to see the Reading TypeList implemented in such a way so that I can show them to people and hear they say "wow". My first major problem with TypePad is that I cannot post from my workplace as all https urls are blocked. As I have only paid for the basic package, I can't make use of the e-mail/moblogging options. If Amazon can manage to give me a http solution why can't TypePad? Anyway, I looked around for some client tools that would use the XML-RPC API. I found out how to set up w.bloggar to work with TypePad, so I downloaded the latest version and then tried to post this message. After reading this article by Bill Thompson I wondered why I had never started a blog. 1) I didn't like the look of Blogger. 2) Didn't have anything worthwhile to say. So I decided to do a usability review of TypePad and take the opportunity to see if blogging had any value for me.